The practice of dubbing over European productions, as with all dubbed foreign language productions, risks a potential disconnect between the spoken language and opposing cultural references within the diegetic world, ranging from instances of untranslated writing to a specific international landmark. 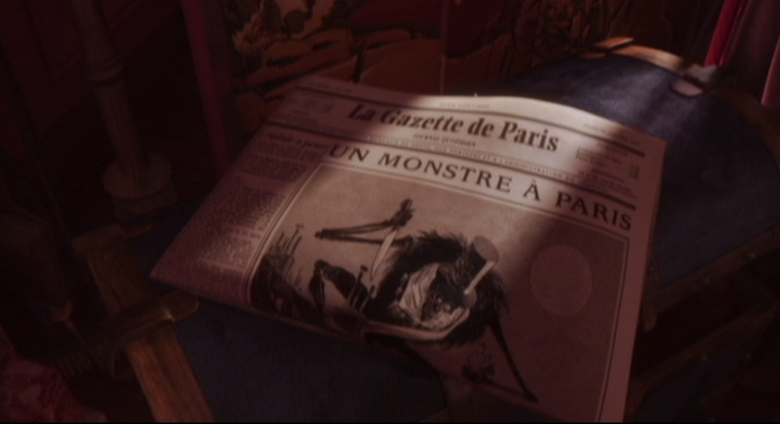 With a film like the French feature Un Monstre à Paris (A Monster in Paris, 2011, by Bibo Bergeron), which is essentially an ode to Paris itself, this disconnect arguably becomes more noticeable. Fig. 1. An untranslated newspaper headline, establishing the film’s setting despite most of the cast’s American accents. The English dub cast of A Monster in Paris features a roster of established character actors (including Catherine O’Hara, Danny Huston and Adam Goldman), who have a fast-paced comedic manner of speaking with their natural North American accents and work with an adapted script littered with English-language idioms. 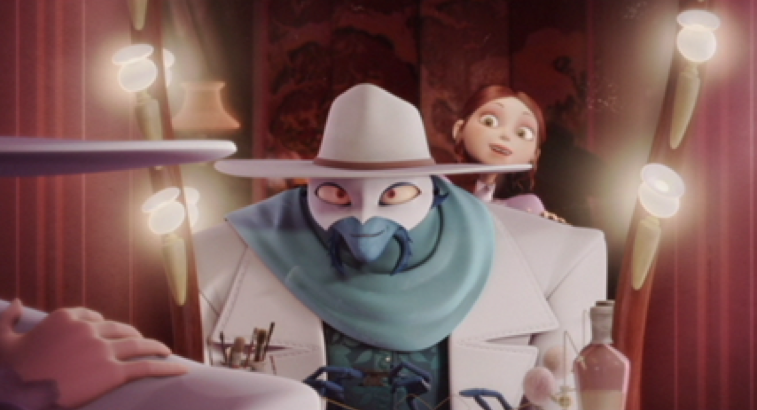 The ‘authority of the animated image could, in this manner, be thought of as undermined by the “American” voice that narrates it… nationality is filtered through America, as the film’s overall “voice” becomes nationally conflicted [and] deeply impacts on their understanding of the film’s cultural and national meanings’ (Denison 2005). However, the dual casting of Vanessa Paradis as cabaret singer Lucille in both the English- and French-language versions suggests the English-production wanted to add a certain degree of authenticity, as well as establish a connection to its Parisian setting by utilizing Paradis’ status as a well-regarded singer, her French-accented performance, and her ability to sing both languages fluently. As a musical, its songs are also adapted for English-speaking audiences. Low (2013: 229-231) writes about the differentiation between translation and adaptation, which are distinguished according to faithfulness to the original or transferring certain details. Khoshsaligheh and Ameri (2016: 80) also cite Low’s term ‘singability’ as the priority in song translation and adaptation[. Sean Lennon replaces French rock singer Matthieu Chedid (credited on the soundtrack as -M-)as Francœur the giant flea’s singing voice in English, and Francœur’s solo number ‘A Monster in Paris’ has Lennon singing the original French pronunciation of ‘Paris’ to better fit the rhyme scheme. Overall, this version is an incredibly faithful translation, with lyrics adapted only with the intent to make the translation flow more naturally with the original music. However, lyric adaptation can result in certain phrases and meanings being lost in the translation. ‘La Seine and I’ is a catchy cabaret tune first sang as a solo for Lucille before its reprisal as a more upbeat duet between Lucille and Francœur. The first line in French – ‘Elle sort de son lit’, which translates literally in English as ‘She bursts her banks’ – has a double meaning. Literally, it can refer to the River Seine overflowing in 1910, the era in which the film is set. Metaphorically, it also refers to the river (or an unnamed female) ‘overflowing’ with confidence. The line is adapted in English as ‘She’s resplendent, so confident’, negating the first meaning and removing both linguistic and cultural references. Additionally, the second verse in French changes the subject of the song from ‘La Seine’ to ‘la scène’, wordplay that only works as a homophone and fits the rhyming scheme in French. This adds another layer to the song as a celebration not only of the Seine, but also of Lucille’s performance on stage. In the adaptation process this nuance is lost. Lucille’s name is also removed from Francoeur’s verse in English (‘Extra Lucille, quand tu es sur la scène’/’Great Lucille, when you are on the stage’), although it keeps the implication of her as the object of Francouer’s focus through his line ‘from this angle, like an angel’ while Lucille is dressed as an angel. This is an example of how certain nuances of language that do not translate with great ‘singability’ can be adapted. Compromise is needed; however, the original intent can still be implied or replaced with a different metaphor specific to the adapted language. Fig. 2. The film opens in a classic cinematheque, referencing the 1910 over-flowing of the River Seine. 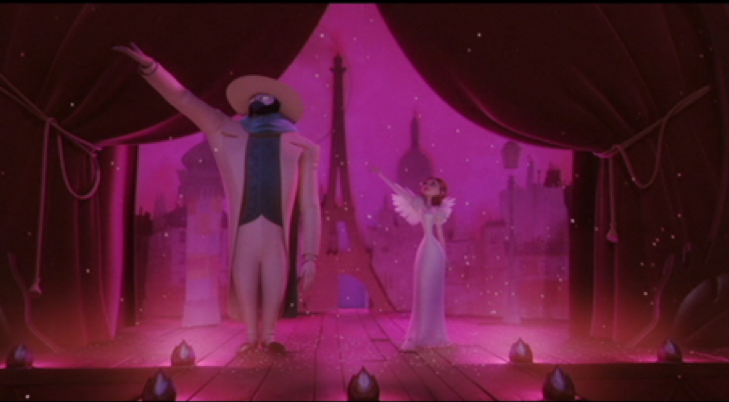 References to French culture are rife throughout the film. 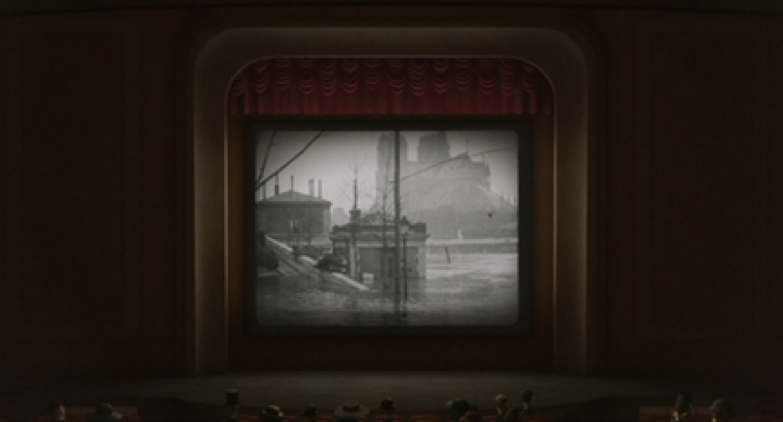 For instance, the film opens with a 1910 newsreel report, in an old-fashioned cinematheque, of the Seine overflowing. Also, plot elements are heavily borrowed from Le Fantôme de l’Opéra (The Phantom of the Opera) by Gaston Leroux; notably that of a mysterious, deformed figure who expresses internal desires through songs and develops a bond with a musically-gifted beautiful young woman (e.g. see fig. 3). In both works, a childhood friend named Raoul also pursues the young singer. The film’s songs tell of Paris’ beauty, from ‘La Seine and I’ to ‘Papa Paris’. During the former, Francœur and Lucille perform against a backdrop of Paris – both on-stage and in a fantasy sequence – which is bathed in a pink light, which typically suggests a feeling of love (see fig. 4 & 5). Fig. 4 & 5. ‘La Seine and I’ song sequence, bathed in pink light. ‘A Monster in Paris’ plays over a sequence shown from Francœur’s point of view as he was doused with potions that caused his massive growth and singing abilities, met with fear and revulsion from the Parisian people as he jumps over the rooftops of Paris. Fig. 6. 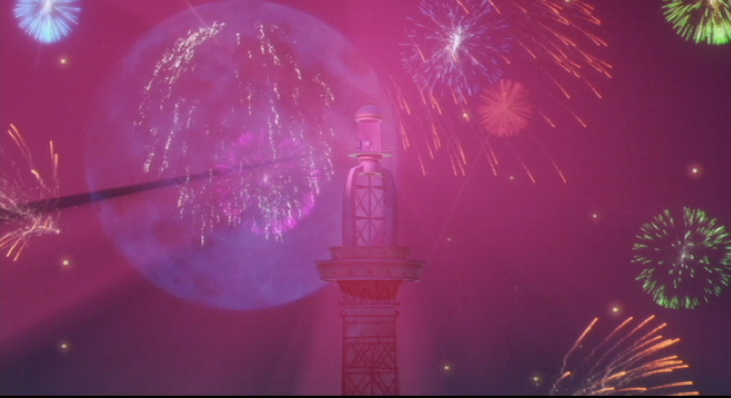 The Eiffel Tower, which features extensively throughout the film, is the setting for the climax. The French-language track is currently unavailable legally in the U.K. on both DVD and for streaming. The English-language version is therefore the default version outside of French-speaking territories. This results in the loss of both cultural and linguistic context through the adaptation of the songs into English, as opposed to direct translation of the lyrics (as impractical as the latter option is). 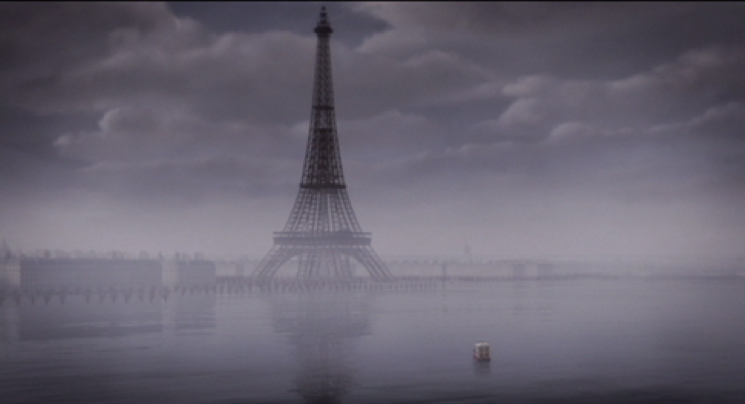 Paris is the centre of the film’s plot and setting, to the extent that the city is a character in its own right. The loss of cultural identity in the Americanized version ultimately leads to homogenization, as a lack of understanding of national and cultural identity stems from the superimposed American interpretation of France. Louise Milsom has obtained a BA in Film from the University of the West of England. Her dissertation analyzed Tex Avery’s use of animation in his ‘Red’ trilogy to subvert traditional fairy-tale depictions of femininity. Her MA in Curating final project – a season of films entitled ‘More than Miyazaki’ which celebrated a century of anime by exploring selected works outside the oeuvre of Studio Ghibli – was a sold-out success. Louise’s next goal is to research how physical disability is ‘performed’ in animation. Denison, R. (2005). ‘Disembodied stars and the cultural meanings of Princess Mononoke’s soundscape’, Scope: An Online Journal of Film Studies 3 (1). Available from: https://www.nottingham.ac.uk/scope/documents/2005/october-2005/denison.pdf [Accessed 20 February 2019]. Khoshsaligheh, M. & Ameri, S. (2016). ‘Exploring the singability of songs in A Monster in Paris dubbed into Persian’, Asia Pacific Translation and Intercultural Studies, 3 (1), pp. 76-90. Low, P. (2013). ‘When Songs Cross Language Borders: Translations, Adaptations and ‘Replacement Texts’’, The Translator 19 (2), pp. 229-231.